Google will soon become a modern-day TV guide with live listings in search results. 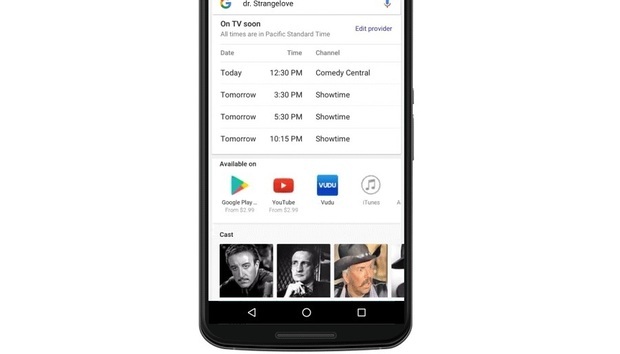 Once the feature rolls out, searching for show titles will bring up a list of air times and channels at the top of the Google search results page. Users will also be able to specify a TV provider for precise local results. Last year, Google dipped its toes in this territory by listing streaming sources when users looked up a particular movie or TV show. Those results will soon appear below the live TV listings. It’s unclear, however, if the listings will cover all TV providers, or just a subset of participants. With streaming video sources, Google is requiring providers to register their interest and markup their webpages so that show information is visible to Google’s search engine. Google hasn’t said anything about bringing these listings and search results to its TV devices. Live TV listings could be pretty useful for Google’s Android TV platform, for instance, if it allowed users to jump to the appropriate channel or set a reminder on the television. Why this matters: Today, finding out TV showtimes can be a hassle without heading to your cable box, as TV networks tend to bury their schedules behind layers of menus on their often-clunky websites. It’s a natural problem for Google to solve as continues to expand its search offerings beyond the basic list of links.